Cesarean section (C-section) is a surgical intervention, which is carried out to ensure the safety of mother and child when vaginal delivery is not possible or when the doctors consider that the danger to mother and baby would be greater with vaginal delivery. The C-section is associated with an increased morbidity and mortality among delivering mothers and infants, especially in developing countries. The World Health Organization (WHO) and the Pan American Health Organization suggested that the best C-section rate for a country should range from 5% to 15%. However, the prevalence of cesarean section has been increasing in both developed and developing countries. The first study presented the prevalence of C-section worldwide by Betrán et al., which included 155 countries published from 1990 to 2014 that estimated the rate of C-section worldwide as 18.6% with a range from 6% to 27.2%. The rate was higher in developed countries and lower in developing countries. Latin America and the Caribbean region have the highest C-section rate (40.5%), followed by Northern America (32.3%), Oceania (31.1%), Europe (25%), Asia (19.2%), and Africa (7.3%). C-section indications vary among different populations and countries, and there is no world standard classification system for indications of C-sections. The most common indications for cesarean delivery include previous C-section, multiple pregnancy, breech presentation, fetal distress, lack of progress in labor, small fetus and macrosomia, cord prolapse, transverse or oblique lie of the fetus, head and pelvis mismatch, previa or abruptio placenta, and severe preeclampsia. Little is known about the actual rate of C-section in Libya and what are the indications that are used by doctors to decide on cesarean delivery. This information is even scarce in small cities and regions distant from the capital or large hospitals; the Health Authority and Social Insurance in Libya estimated the rate of C-section as 7.6% in 1996. It has also been reported that the rate of C-section at a hospital in Benghazi in 2009 was 22.4%. According to this limited available research, the cesarean section rate in Libya is considerably higher than the rate recommended by the WHO. The poor governmental supervision and regulation of health sector have raised concerns about a possible increase in cesarean sections. Hence, estimating the prevalence of cesarean and its indication can be helpful in planning appropriate strategies for decreasing rate of cesarean. Therefore, the purpose of the present study was to determine the prevalence of C-section and common indications in Al-Wahda Hospital, Derna, Libya. A retrospective study of medical notes and records was conducted at the Department of Obstetrics and Gynecology, Al-Wahda Hospital, which is the only teaching and referral hospital in Derna. Initially, the case records of all women who gave birth in Al-Wahda Hospital were retrieved from January 1, 2013, to December 31, 2016. Data were collected by trained data collectors using a standardized paper form and then entered into an electronic database. Regular consistency checks ensured that any missing data were tracked by the data collector and entered into an electronic database. A standardized data collection form that included age, obstetric history including parity status, maternal outcome, and neonatal outcome was designed to meet the requirement of the study. Neonatal outcomes such as gestational age, gender of baby, birth weight, and perinatal mortality were also documented. Data analysis was performed using SPSS software version 23 (IBM, Ottawa, Canada). Descriptive statistics, including percentage, mean, range, and standard deviations (SDs), were calculated for all variables. The total number of mothers who gave birth from 2013 to 2016 in the Al-Wahda Hospital in Derna city was 15,144, of which 3560 had a C-section, making the overall C-section rate from 2013 to 2016 in Derna as high as 23.5%. Moreover, the C-section rates did not differ much between the years with a slight increase in the rate of C-section from 22.8% in 2014 to 24.4% in 2016 [Table 1]. The age of mothers who give birth by C-section ranges from 15 to 49 years with mean ± SD age of 31.4 ± 6.06 years. However, most of mothers, that is, 1657 (45.4%) and 1700 (46.6%) who had cesarean deliveries, were in the 20–30 and 30–40 years' age group, respectively. The rate of term babies was higher in C-section (3226, 88.4%) compared to natural delivery babies. 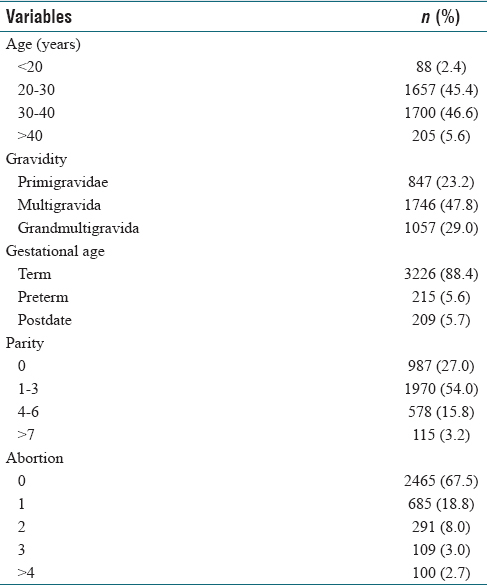 The majority of mothers who give a birth by C-section (1746, 47.8%) were multigravidas, of which 1970 (54.0%) were between 1 and 3 parity and 2465 (67.5%) had no abortion [Table 2]. Birth outcome was one of the variables used during this study. Therefore, from those fetuses who delivered by C-section, the majority of them (98.7%) were alive and 96.7% were single fetus. The study revealed that most of the fetuses (33.4%) delivered by cesarean with appropriate weight (3000–3500 g) [Table 3]. 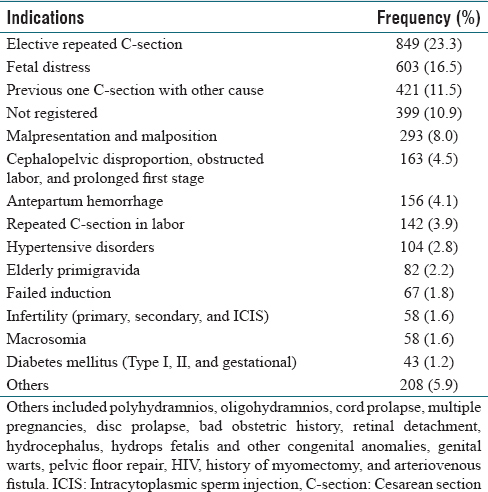 The most common indications were elective repeated C-section (23.3%), followed by fetal distress (16.5%) and previous one C-section with other causes (11.5%) [Table 4]. However, a total of primigravide women who deliver by C-section in this study were 847 (23.2%), 251 (29.6%) of them fetal distress were main indication for C-section [Table 5]. This is the first study to estimate the rate of C-section in Derna city/Libya. The prevalence of C-section was 23.5%. However, the WHO recommended that the rate of C-section should be within 10%–15%; thus, this study showed a higher rate. This may be because Al-Whada Hospital is the only referral center in Derna and surrounding area and we did not take into account mothers delivered at home or in private clinics or in other nearby hospitals. This estimate, therefore, is higher than the overall mean prevalence worldwide that was found to be 18.6, with a range from 6% to 27.2% by Betrán et al. This Libyan estimate was also within the range of the overall rate of C-section in Arab countries, which ranged from 26.2% in Egypt having the highest rate and 5.3% in Mauritania having the lowest rate. And slightly lower than the rate of C-section in England was 21.5%. However, there is a lack of information on C-section in all Arab countries because of lack of national registration systems. We found that our estimate is considerably lower than the published rates in different developing countries. For example, Mansoura University hospital is the only tertiary referral hospital in Dakahlia Governorate within the delta region in Egypt (47.25%). Lower than 27.6% was found at Attat Hospital in Ethiopia. In Tanzania, the cesarean section rate ranged from 29.9% to 35.5% in a referral hospital. And lower than (27%) the rate of nine participated hospitals across South East Asia in 2005, 35.1% in Argentina, 29.3% in Brazil, 30.7% in Sri Lanka. Furthermore, in two different studies done in Brazil, the rate of cesarean section is 36.5% and 43%. Our estimate is higher than the previous studies done in some developing countries such as 21.7% at the Gynaecology Ward, Lady Reading Hospital, Peshawar, Pakistan  and 21.1% at Mizan Aman General Hospital in Southwest Ethiopia. The prevalence of C-section in developing countries may be high because of low literacy, lack of knowledge and lack of primary health care, and limited knowledge and training of health professionals. However, when our estimate is compared with different estimates from the developed countries, it turns out to be lower than some of the published estimates. For example, in the study done in Italy, the rate was 36%, in USA 32%, and in Latin America and Caribbean 29%. Increased rate in developed countries may be due to health insurance system, fear of litigation, on demand, and extensive use of fetal monitoring. In this study, most of mothers, that is, 1657 (45.4%) and 1700 (46.6%) who had cesarean deliveries, were in the 20–30 and 30–40 years' age group, respectively. This is in contrast to the study in a rural block of the State of West Bengal found the common age group where delivered by C-section was highest among women <25 years of age followed by women between 25 and 30 years of age. Moreover, another retrospective study found that majority of mothers having C-section s fall in the 21–30 years' age group which was conducted in Department of Obstetrics and Gynaecology, Punjab Institute of Medical Sciences, Jalandhar (Punjab, India). A study found that most of the mothers having C-sections are between the age group of 20–24 years and 25–35 years. This is different than other studies done in Ethiopia, which found a higher rate of C-section among older age group. The second most frequent indication in this study was fetal distress (16.5%). Fetal distress has always been one of the most important medical indications for C-section.,, However, among nullipara, the most common indication was fetal distress (29.6%), followed by malpresentation and malposition (15.7%). This finding coincides with studies conducted among 9241 gravidas who delivered at the Maternity and Children's Hospital, Buraidah, Qassim Region, Kingdom of Saudi Arabia. The present study limitation is the fact it is being retrospective with the sources of data were medical notes and records in which sometimes are not perfect. The high prevalence rate of C-section was found in Derna. Elective repeated C-section was the most common indication, followed by fetal distress and previous one C-section with other causes. Educational program for pregnant women about ways for avoiding risk factors of unnecessary C-sections during antenatal care visits is warranted. We appreciate the help and support of the medical and clerical personnel in Al-Wahda hospital in Derna and the advice from Dr. Osama Tashani of MENA Research group at Leeds Beckett University. Gregory KD, Jackson S, Korst L, Fridman M. Cesarean versus vaginal delivery: Whose risks? Whose benefits? Am J Perinatol 2012;29:7-18. Festin MR, Laopaiboon M, Pattanittum P, Ewens MR, Henderson-Smart DJ, Crowther CA, et al. Caesarean section in four South East Asian countries: Reasons for, rates, associated care practices and health outcomes. BMC Pregnancy Childbirth 2009;9:17. National Institutes of Health state-of-the-science conference statement: Cesarean delivery on maternal request March 27-29, 2006. Obstet Gynecol 2006;107:1386-97. Torloni MR, Betran AP, Souza JP, Widmer M, Allen T, Gulmezoglu M, et al. Classifications for cesarean section: A systematic review. PLoS One 2011;6:e14566. Miri FL, Abbasi SM. Caesarean section change trends in Iran and some demographic factors associated with them in the past three decades. J Fasa Univ Med Sci 2012;2:127-34. The General People's Committee for Health and Social Insurance [Libya]. Arab Libyan Maternal and Child Health Survey: Principal Report. The Great Socialist; 1996. Busarira MO, Gahwagi MM, Alaguri NK. Rate, indications and complications of caesarean section at Aljamahiriya Hospital, Benghazi, Libya. Bull High Inst Public Health 2011;41:359-67. Khawaja M, Choueiry N, Jurdi R. Hospital-based caesarean section in the Arab region: An overview. East Mediterr Health J 2009;15:458-69. Thomas J, Paranjothy S. The National Sentinel Caesarean Section Audit Report. London: RCOG Press; 2001. p. NEJMc090206. Helal AS, Abdel-Hady ES, Refaie E, Warda O, Goda H, Sherief SL. Rising rates of caesarean delivery at Mansoura University Hospital: A reason for concern. Gynecol Obstet 2013;3:146. [Doi: 10.4172/2161-0932.1000146]. Moges A, Ademe BW, Akessa GM. Prevalence and outcome of caesarean section in Attat Hospital, Gurage Zone, Snnpr Ethiopia. Arch Med 2015;7:1-6. Maaløe N, Sorensen BL, Onesmo R, Secher NJ, Bygbjerg IC. Prolonged labour as indication for emergency caesarean section: A quality assurance analysis by criterion-based audit at two Tanzanian rural hospitals. BJOG 2012;119:605-13. Souza JP, GĀlmezoglu A, Lumbiganon P, Laopaiboon M, Carroli G, Fawole B, et al. Caesarean section without medical indications is associated with an increased risk of adverse short-term maternal outcomes: The 2004-2008 WHO global survey on maternal and perinatal health. BMC Med 2010;8:71. Sakae TM, Freitas PF, d'Orsi E. Factors associated with cesarean section rates in a university hospital. Rev Saude Publica 2009;43:472-80. Mendoza-Sassi RA, Cesar JA, Silva PR, Denardin G, Rodrigues MM. Risk factors for cesarean section by category of health service. Rev Saude Publica 2010;44:80-9. Naeem M, Khan MZ, Abbas SH, Khan A, Adil M, Khan MU, et al. Rate and indications of elective and emergency caesarean section; a study in a tertiary care hospital of Peshawar. J Ayub Med Coll Abbottabad 2015;27:151-4. Gutema H, Shimye A. Caesarean section and associated factors at Mizan Aman General Hospital Southwest Ethiopia. J Gynecol Obstetr 2014;2:37-41. Torloni MR, Betrán AP, Montilla P, Scolaro E, Seuc A, Mazzoni A, et al. Do Italian women prefer cesarean section? Results from a survey on mode of delivery preferences. BMC Pregnancy Childbirth 2013;13:78. Althabe F, Sosa C, Belizán JM, Gibbons L, Jacquerioz F, Bergel E, et al. Cesarean section rates and maternal and neonatal mortality in low-, medium-, and high-income countries: An ecological study. Birth 2006;33:270-7. Leitch CR, Walker JJ. Cesarean section rates. Evaluate the reasons for surgery. BMJ 1994;308:133-4. Pal DK, Mondal T, Ghosh R. Epidemiological determinants affecting caesarean section in a rural block of West Bengal. IOSR J Dent Med Sci 2015;14:120-2. Kaur J, Singh S, Kaur K. Current trend of caesarean sections and vaginal births. Adv Appl Sci Res 2013;4:196-202. Moges A, Wondafrash Ademe B, Muleta Akessa G. Prevalence and outcome of caesarean section in Attat Hospital, Gurage Zone, Snnpr Ethiopia. Arch Med 2015;7:1-6. Al Busaidi I, Al-Farsi Y, Ganguly S, Gowri V. Obstetric and non-obstetric risk factors for cesarean section in Oman. Oman Med J 2012;27:478-81. Abu-Heija A, Rasheed R, el-Qaraan O. Effect of age and parity on primary caesarean section rates. Clin Exp Obstet Gynecol 1998;25:38-9. Shamshad. Factors leading to increased caesarean section rate. Gomal J Med Sci 2008;6:1-4. Sreevidya S, Sathiyasekaran BW. 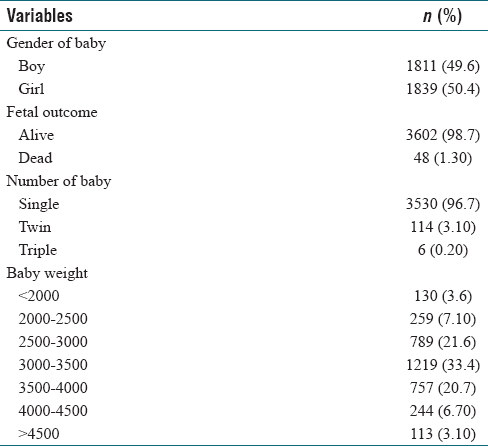 High caesarean rates in madras (India): A population-based cross sectional study. BJOG 2003;110:106-11. D'Orsi E, Chor D, Giffin K, Angulo-Tuesta A, Barbosa GP, Gama Ade S, et al. 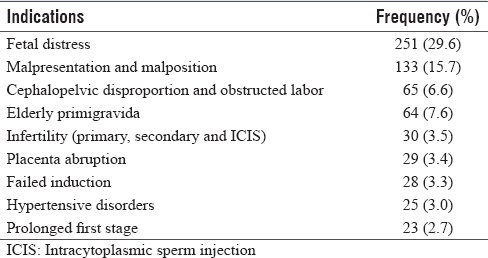 Factors associated with cesarean sections in a public hospital in Rio de Janeiro, Brazil. Cad Saude Publica 2006;22:2067-78. Haider G. Frequency and indications of caesarean section in a tertiary care hospital. Pak J Med Sci 2009;25:791-6. Qin C, Zhou M, Callaghan WM, Posner SF, Zhang J, Berg CJ, et al. Clinical indications and determinants of the rise of cesarean section in three hospitals in rural China. Matern Child Health J 2012;16:1484-90. Ahmed SR, Alsheeha MA, Alsammani MA. Risks and indications for cesarean sections in primiparous women: A case-control study. Ann Trop Med Public Health 2013;6:541-4.